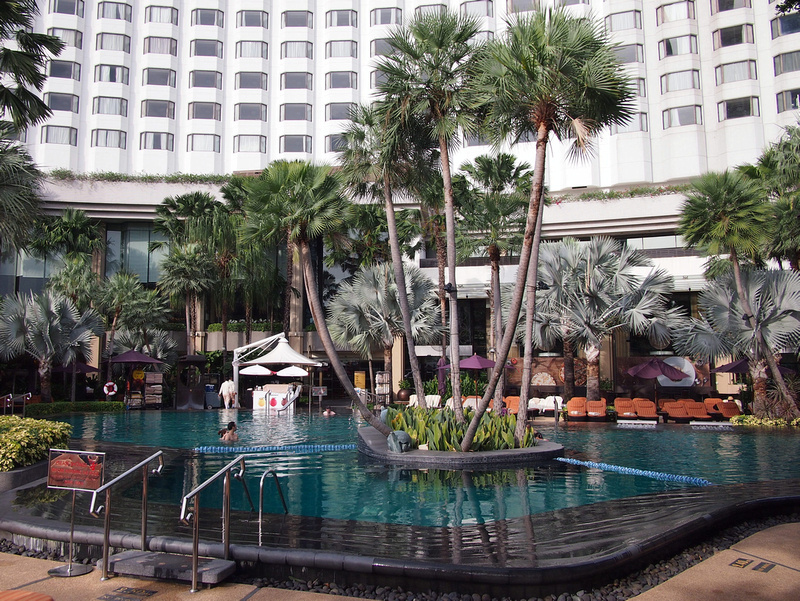 The Shangri-La Hotel Bangkok is a famous 5-star hotel on the banks of the Chao Praya river. 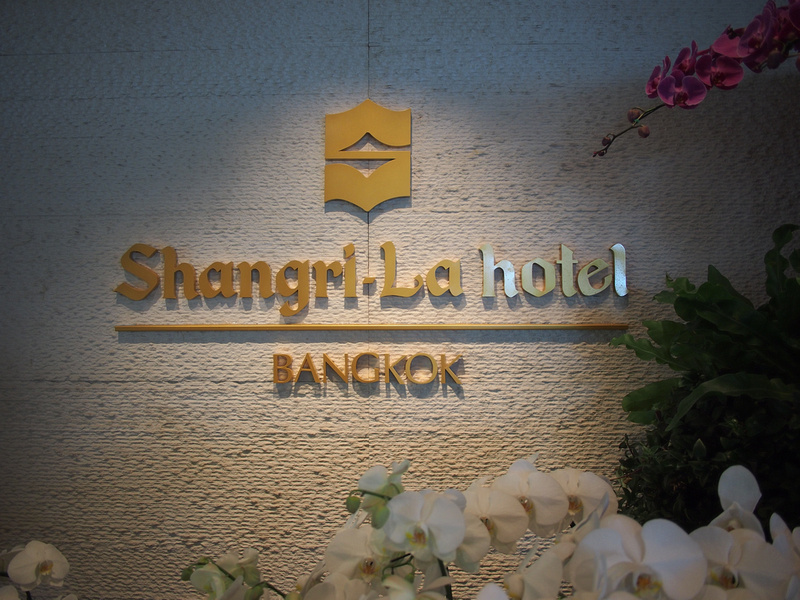 I stayed here for a night as a guest of Shangri-La in order to review the property. 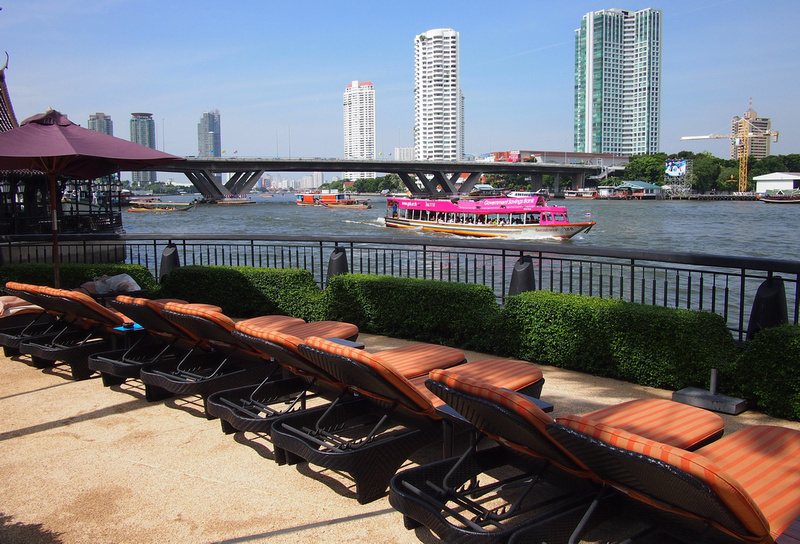 I have stayed at Shangri-La properties before so I knew to expect an exceptional hotel stay, and I was happy to be viewing their Bangkok property after going past it so many times on the river boats. 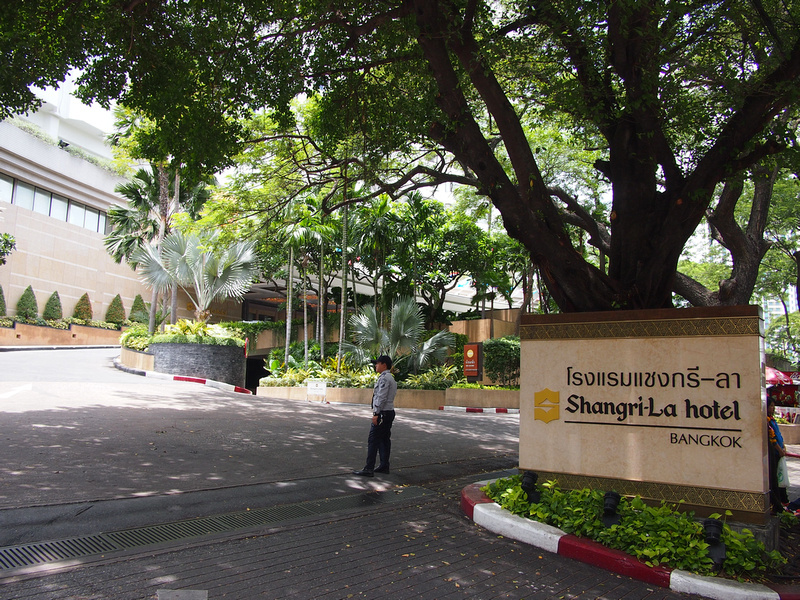 There are two buildings that form part of the property compound: Krungthep Wing and the Shangri-La Wing. 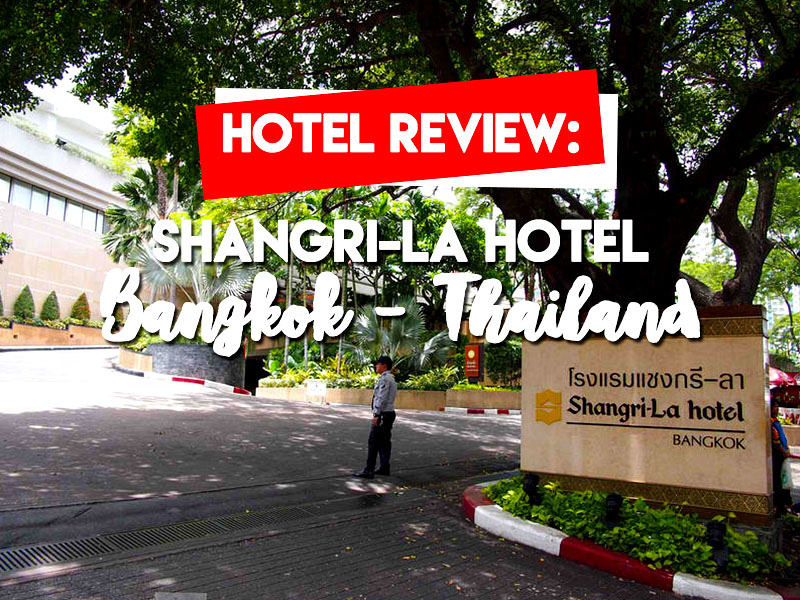 At the time of my stay the Krungthep Wing was being refurbished, so this review deals exclusively with the Shangri-La Wing. 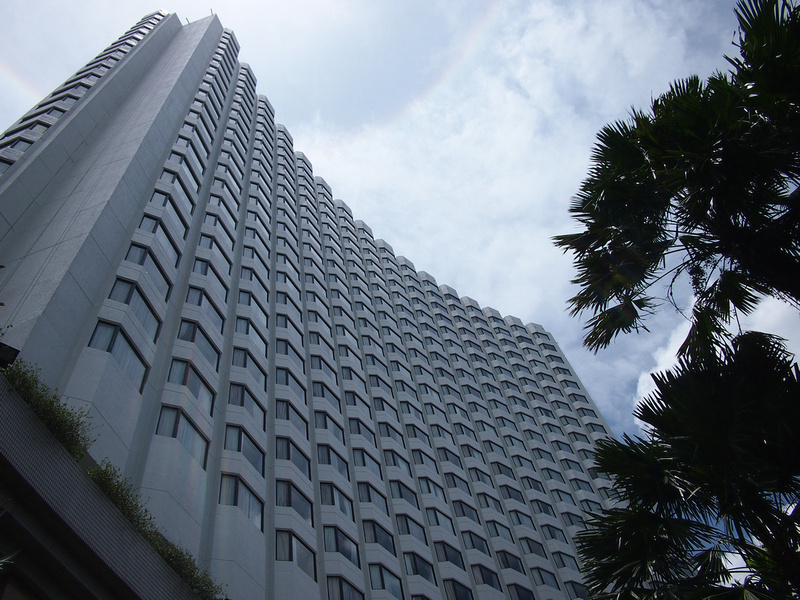 The hotel opened in 1986 with the building that is the Shangri-La Wing. The Krungthep Wing was added in 1991. I never got to see Bangkok in the eighties (I was still in school!) but from what I have seen from old pictures it was a completely different city There were few skyscrapers and no metro system. I mention this because when the Shangri-La acquired this giant block of land on the banks of the Chao Praya river I don’t know if anyone foresaw how the city would grow around it. The hotel is a virtual resort in the middle of a city, and it has this advantage that new central Bangkok hotels would not be able to replicate. While I was staying here I was reading about the British Embassy, which is sitting on a giant block of land in central Bangkok. The land has been valued at 18 billion baht (that’s half a billion dollars) and they are looking to sell. Looking at the Shangri-La property, which has such a wide frontage on the river I can’t image what the value is here in 2016 (especially compared to 1986). I couldn’t get a picture of the whole property from my camera, so here is the view via the hotel website. 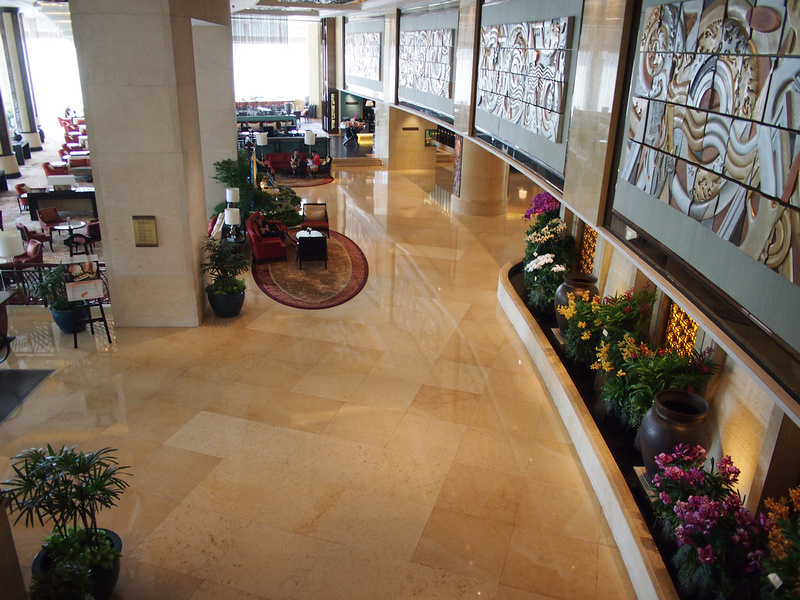 The hotel property of located off Charoen Krung Road, which is a busy major road that runs parallel to the river. There is a small side road that runs from Charoen Krung to the river, and at this entrance their is a little archway proclaiming the location of the hotel. The hotel driveway is shaded by mature trees which must have been on this property before the hotel was built. 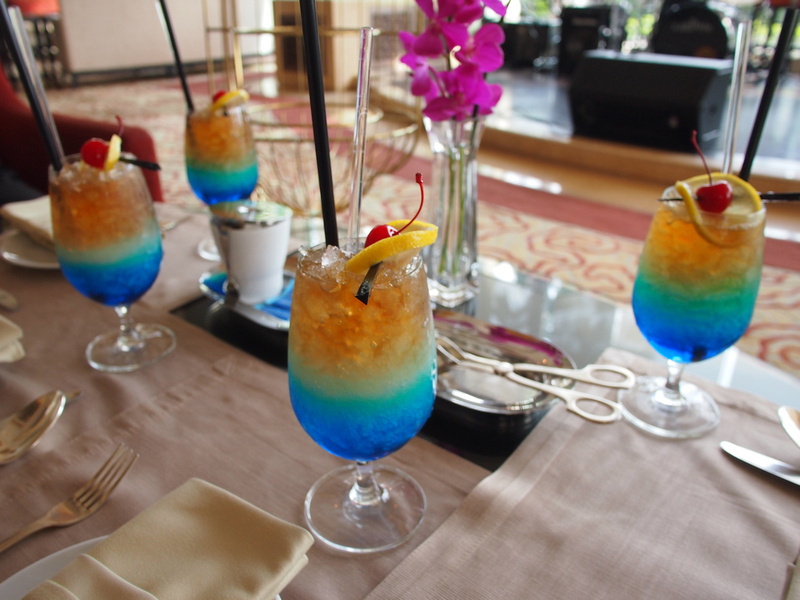 This has been a feature of the other Shangri-La hotels I’ve visited in Singapore, KL, and Penang, which all have beautiful old tropical trees. 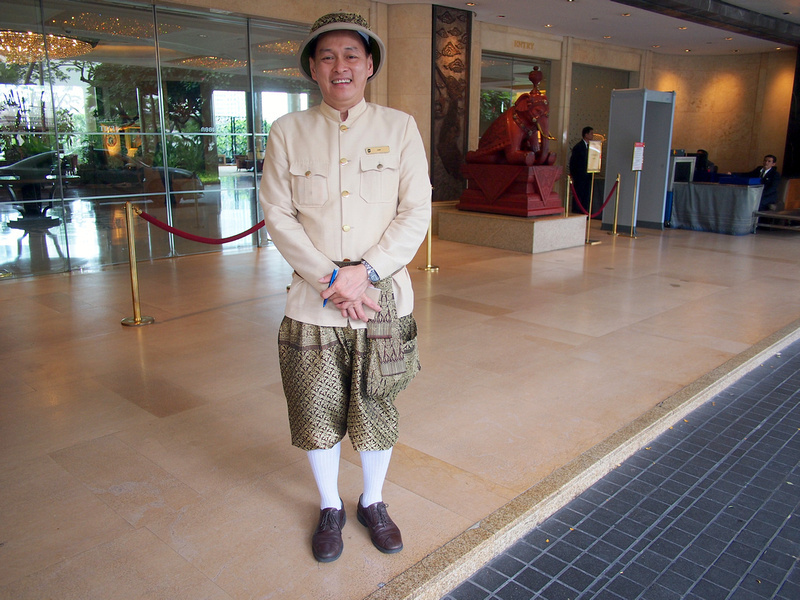 Upon arrival at the hotel you are greeted by a friendly porter in a smart uniform. You get a sense that you are going to be staying somewhere special when you arrive. Inside there is a grand foyer space which opens out to the pool and garden, and beyond that is the river. Huge windows face the riverside, giving a sense of light and space, with lots of room to move. My room was one facing the river. The super-comfortable mattresses were so comfortable I didn’t sit on the lounges. I did enjoy sitting out on the balcony and watching the river traffic go by. 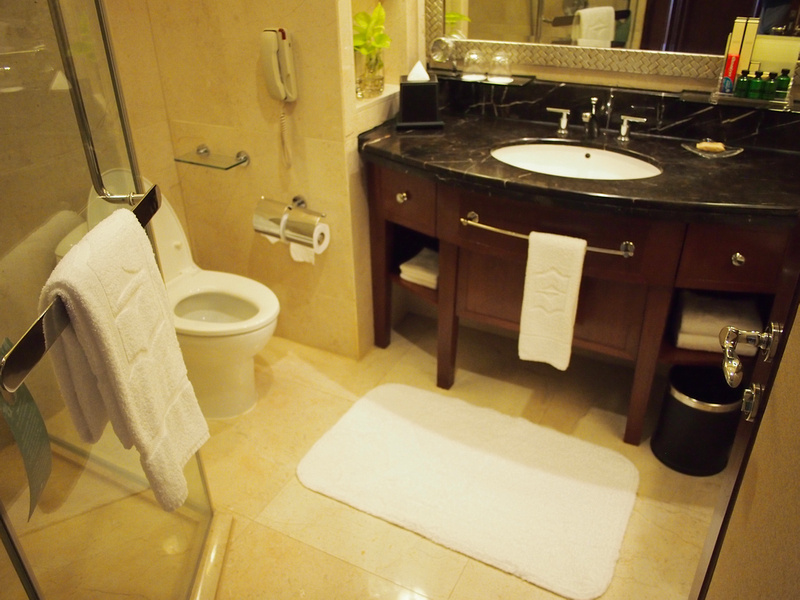 A nice bathroom with a walk-in shower and separate bath tub. There is wifi throughout the property which works everywhere (no need to log in to different hotspots). Once you are logged in there is no need to log in with fiddly passwords. 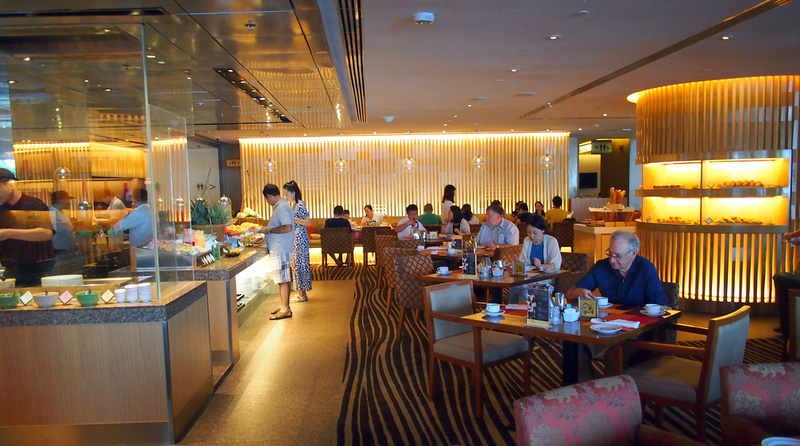 I got a tour of the Horizon Club, which caters for frequent business travellers. 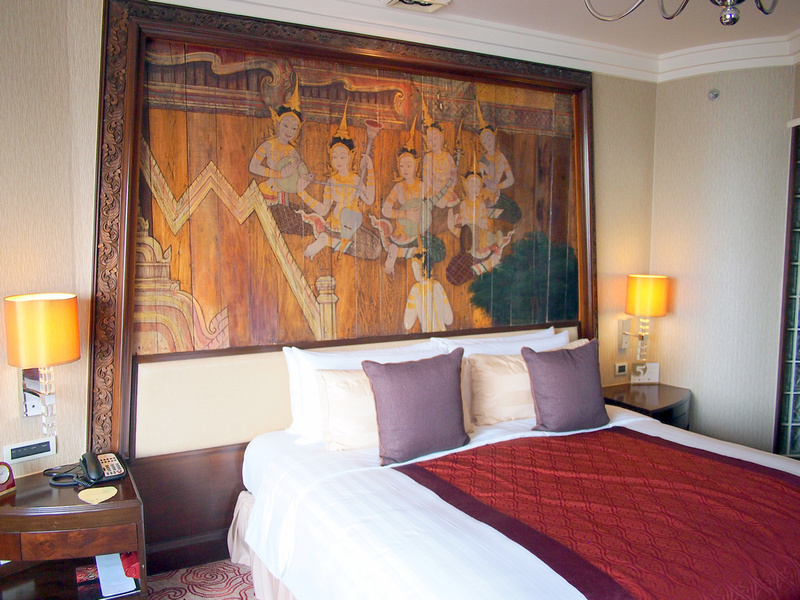 The rooms here are decorated with unique Thai art. The Horizon Club Lounge has meeting facilities and space to work. It also has a commanding view of the river. 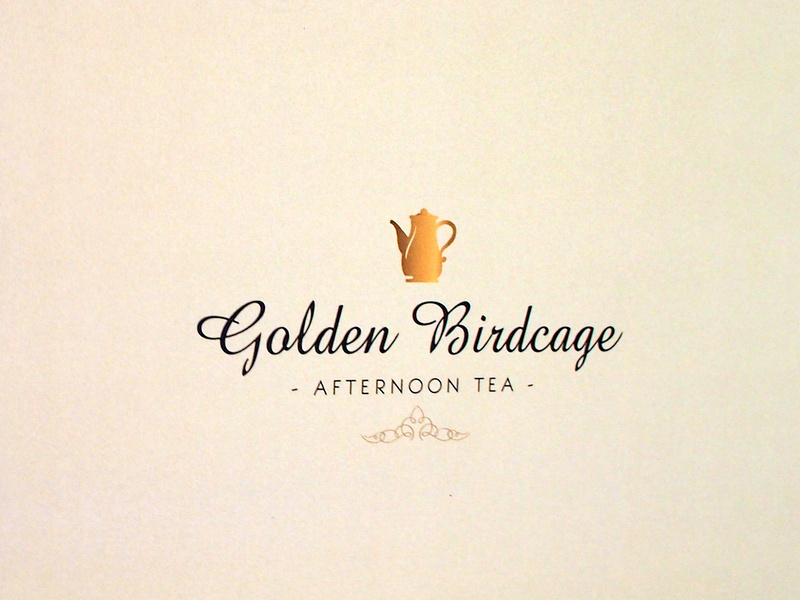 With my packed eating schedule in the city I was unable to visit the restaurants, but I was able to try the “Golden Birdcage” afternoon tea set. 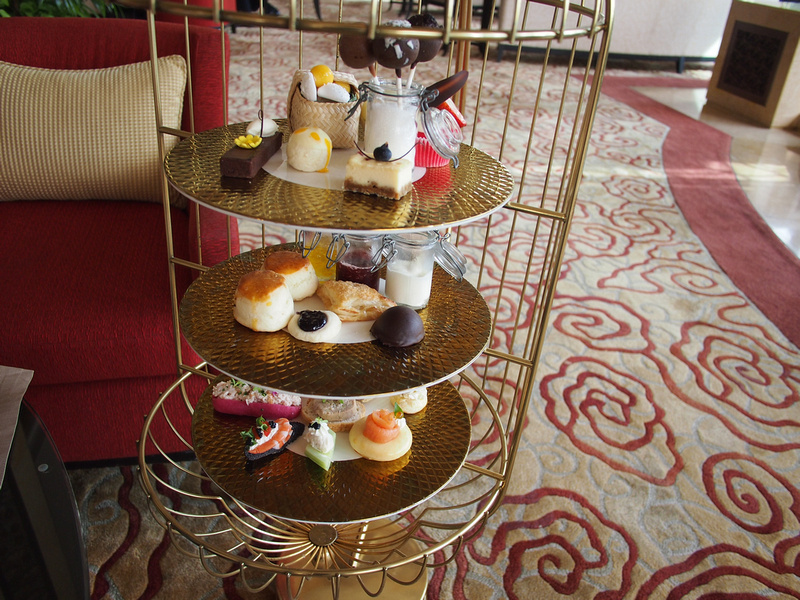 This incredible presentation of sweet and savoury snacks was split between four people. 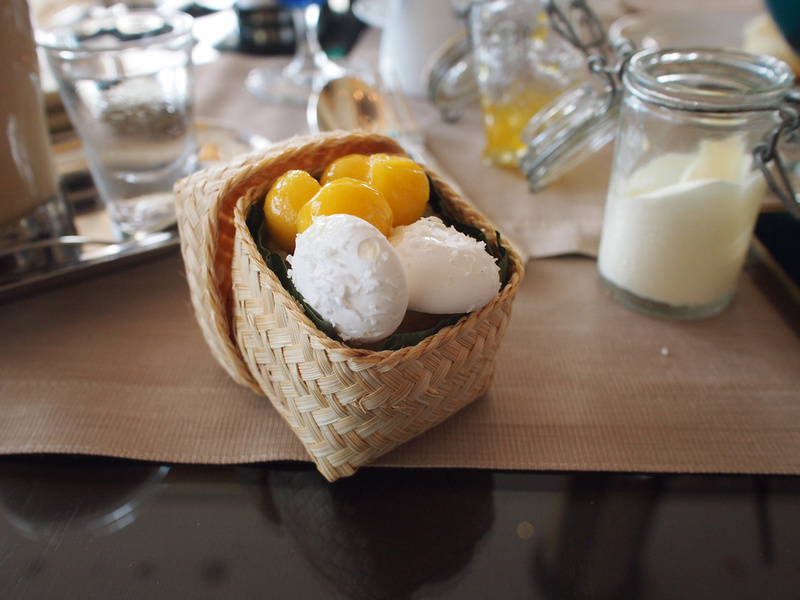 I enjoyed the fresh scones and jam, and this little presentation of a basket of mango and sticky rice. throughout the hotel there six restaurants and three bars. There is also a chocolate boutique. 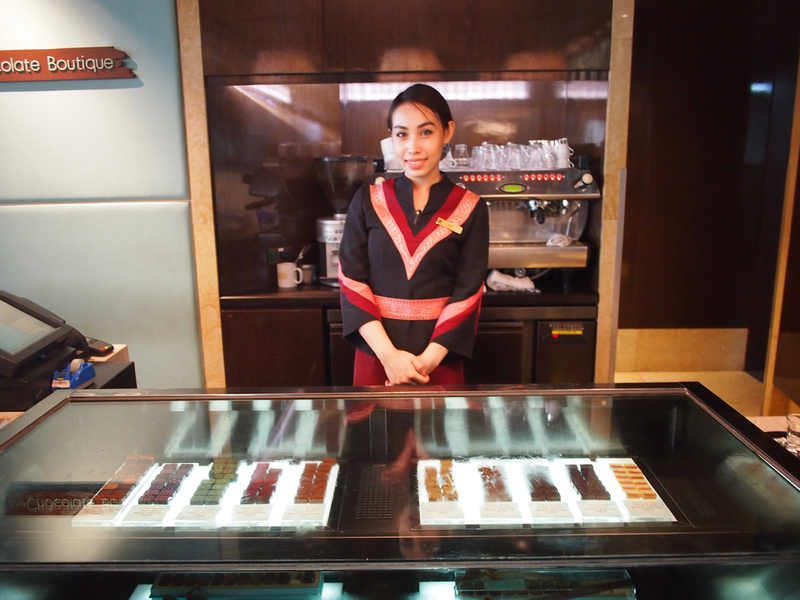 A variety of chocolates are made on site and there is a cafe. 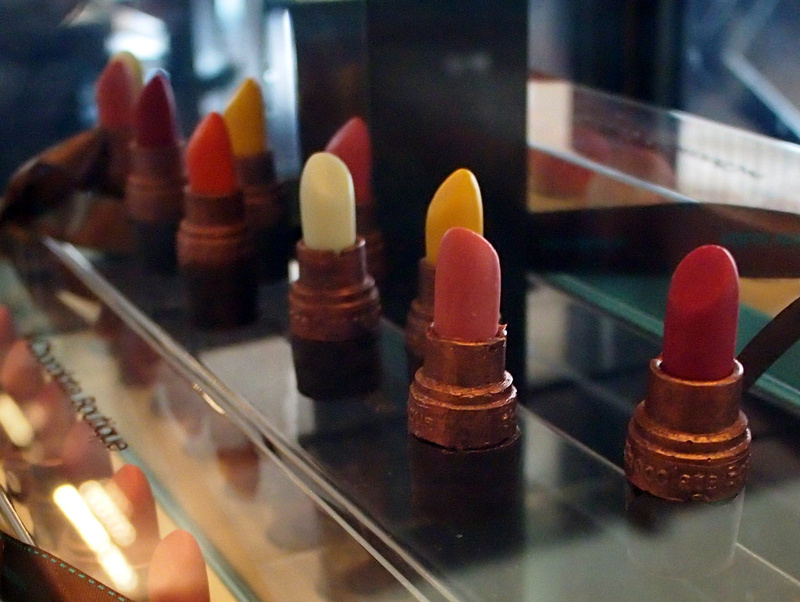 I liked this set of chocolate lipsticks. I loved the pool here. 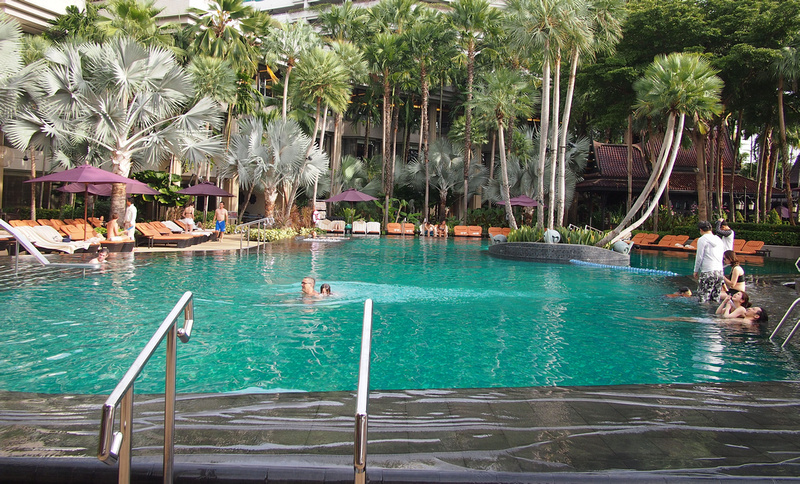 The pool is on the ground between the Shangri-La wing and the river in a large garden area between the two wings. It’s surrounded by trees and there is even a little island in the pool. 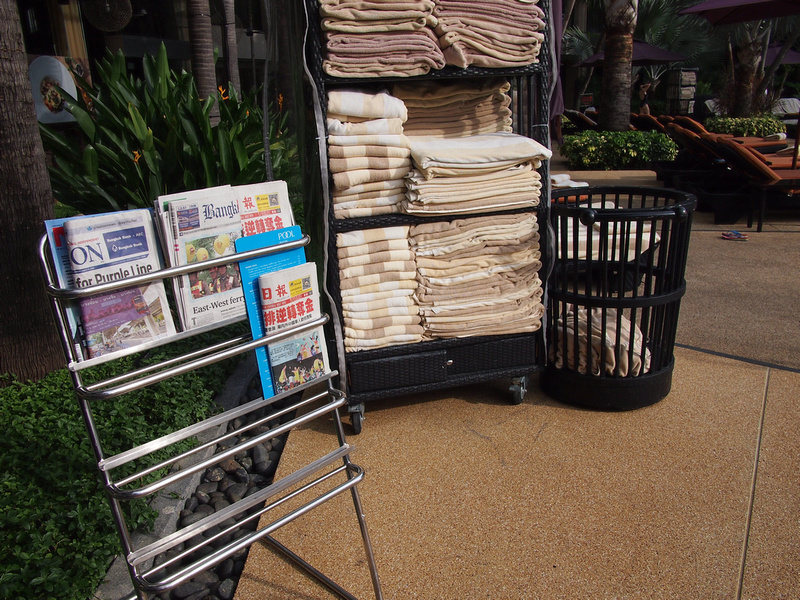 Grab your pool towel at the entry, and there are newspapers and a pile of books as well. 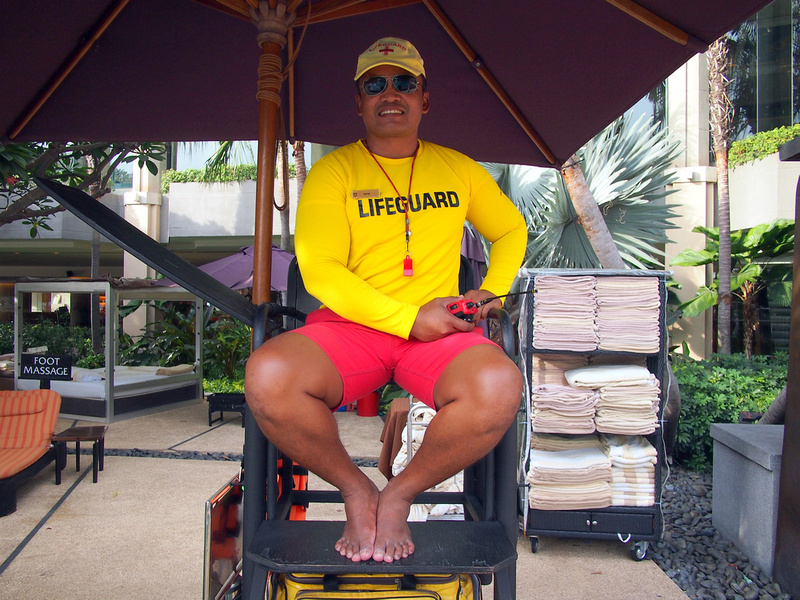 There is a lifeguard on duty, just in case. I made the most of the pool and went swimming before checking out. 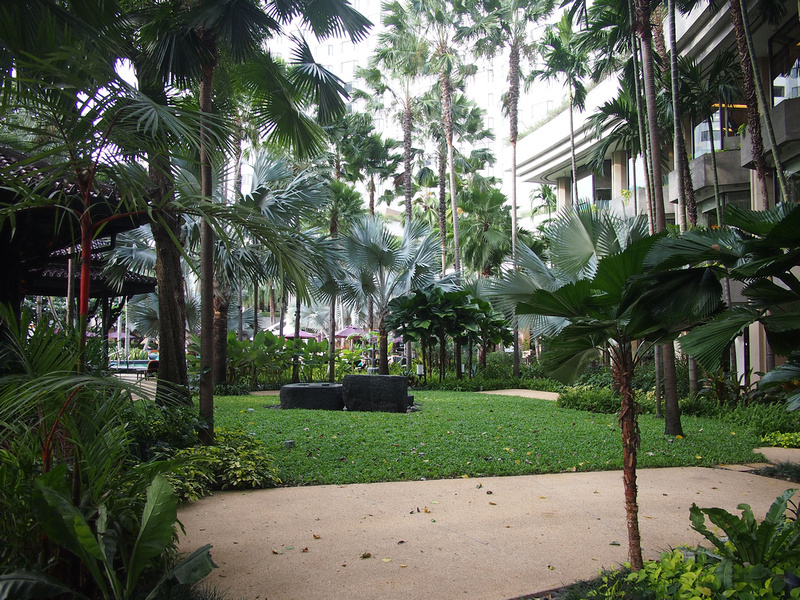 Next to the pool is a garden area that connects the two wings and adds to the overall sense of space at the hotel. There are deck chairs by the pool and under the trees nearby, and if you prefer to watch the world go by on the river then these are the chairs for you. Some nutrition “experts” are trying to tell us that maybe breakfast isn’t the most important meal of the day after all. I don’t care. I love breakfast, and when I saw the breakfast area the afternoon I arrived I already couldn’t wait to have breakfast. 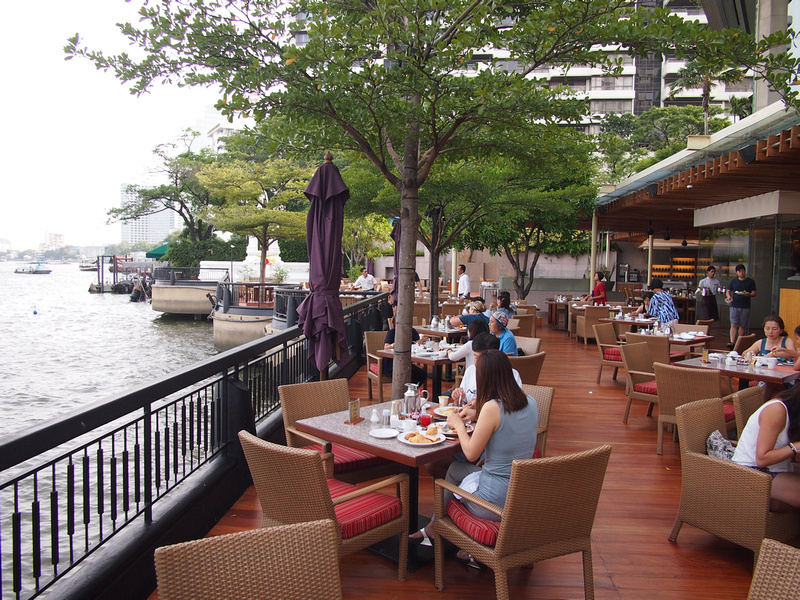 The breakfast area is on the ground floor facing the river, and there is an outdoor area by the the river. With the sun rising behind the building you can sit outside without the glare of the sun and enjoy the riverside scenery. The wifi reaches everywhere on the property, so walking from my room to breakfast I was still connected. I was able to sit outside and read the news online while having a coffee. Of course not everyone likes to sit outside in Bangkok, so there is plenty of room inside. There is a fabulous array of food options, ranging from the classic continental fare, cooked western meals, and a variety of Asian breakfasts (including Thai, Japanese, and Indian). I was glad I had already eaten enough by the time I discovered the pancake bar. 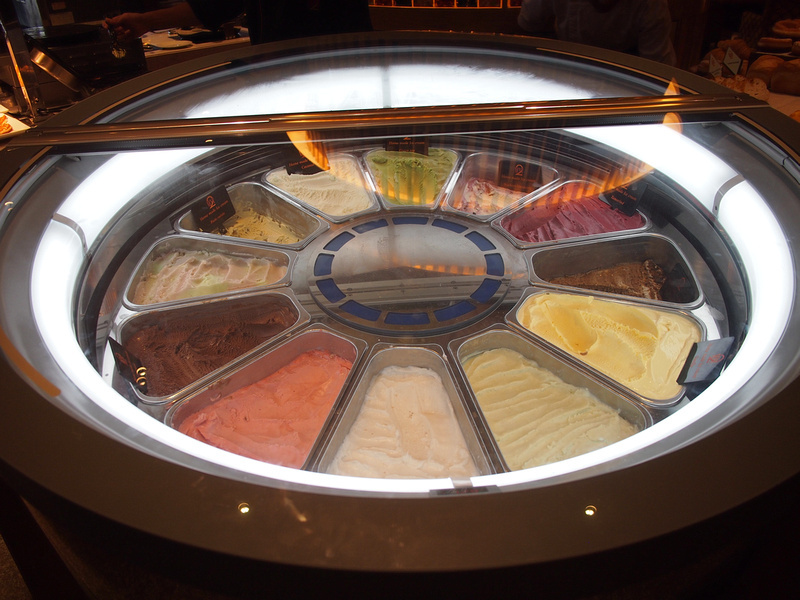 Definition of enough at an all-you-can-eat buffet varies wildly, but I figured I should not go near this ice cream wheel. 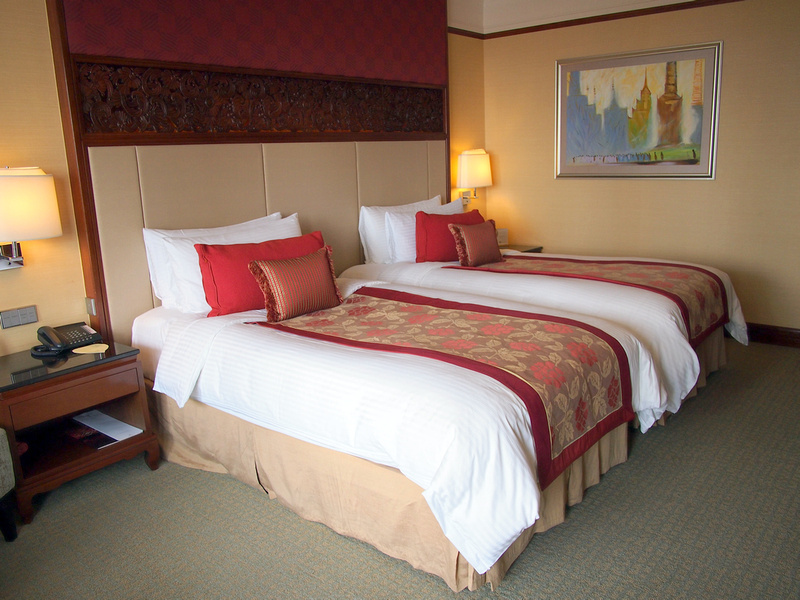 The hotel website has an offers page which has deals on weekend packages or for birthdays. Also have a look at Agoda for any deals they might be offering.